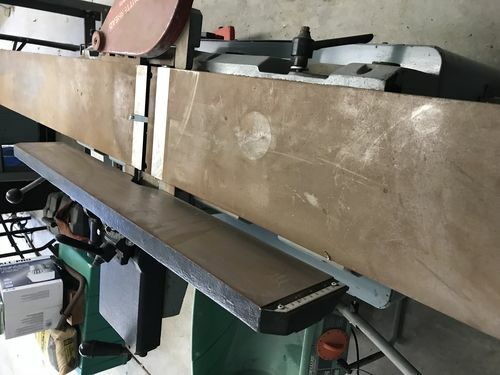 Used 8" Delta DJ 20 Jointer - advice! Hi y’all! I’ve been keeping an eye on CL for an 8” jointer… and I saw one come up today. 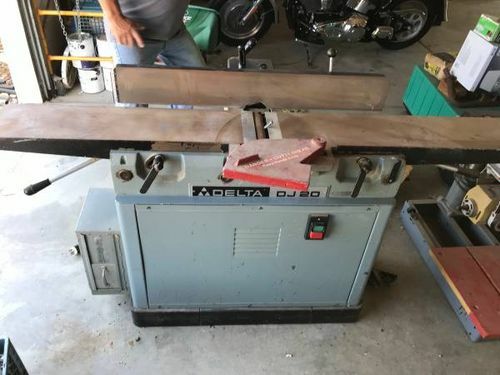 Guy wants $900 OBO for a Delta DJ-20 jointer that he says is in great condition. He sent me thee pictures and even a video to show the condition of the machine. As you can see, it has some surface rust and perhaps some pitting. He rubbed the machine with some oil and steel wool (see photo) and it seemed to clean up well. I won’t know about the table flatness until I head over there with a straight-edge and machine square, but if the tables aren’t each dead flat I’ll pass (if they’re not co-planer I can fix that but I can’t fix warped or twisted myself). I don’t know about motors, but check out the video he sent me. I think it sounds fine. What do y’all think about the price? I have to travel about 45 min to see it, but I’m thinking about offering him $750 given what I see now. Given that I can get a similar new 8” Grizzly jointer for $985 plus shipping and tax, or a Jet for $1500, I’m not sure this is a great deal. Whatch think? Thanks in advance for your help!! Did you get it? I have one just like it, I put a Shelix type cutter from Grizzly. With the cleanup work needed I’d think $800 would be my top but I’d offer $750. FYI If you get it… the set screws that lock the adjuster is actually two set screws stacked on each other, remove one then loosen the other to make table level adjustments on the parallelogram cams. Did you get it? I have one just like it, I put a Shelix type cutter from Grizzly. With the cleanup work needed I d think $800 would be my top but I d offer $750. I haven’t yet, but it’s still available. I’m supposed to go look at it tomorrow. I’m still back and forth on it because I’m looking at an additional $450 to add a helical head – so $1350 total if he won’t budge. That’s still cheaper than a new grizzly (and as Loren pointed out…there’s a LONG wait for that), but I’m trying to weigh whether I’d rather save up and just buy a new one. And thanks for the heads up about the table adjustment set screws! Thanks, Brad. That’s a great perspective. I made the video link public, so let me know if that’s better. After listening a couple more times the motor does sound pretty smooth. I’ll let y’all know what it looks like when I go see it. I’m just nervous about spending so much money. I’d like this to be my last jointer. It wouldn’t last around here for $900. If I needed one I’d buy it. If I wanted to flip it I wouldn’t pay more than 650$. That’s a good model jointer since it has the bushing to Aline the tables. I think your on the right track inspecting table flatness. The Bryd head in my opinion is not a good idea in a jointer. Why don’t you try it with good quality High speed steel knifes and learn how to set knifes with a dial indicater. unless you plan on working with reclaimed wood then the carbide insert will help. The video with the motor sounds great. If memory serves, the DJ-20 was one of Delta’s better jointers back in the day. So you have good bones to start with, especially if it’s a USA made one. If that’s the case, the motor will likely be slightly under as opposed to overrated. The cast iron will be of a better grade than the pacific rim cast iron, though the pacific rim has greatly improved over the years. 8 inch jointers are also preferred over 6 inch. Since I absolutely hate changing the standard knives, I’d definitely look at alternates for the head such as the Shelix or the Pacific Rim alternatives. You may be able to find a suitable alternative for less money than what you’d be out for the Byrd head. One thing to note is whenever you buy used, you buy any headaches from lack of maintenance the previous owner created. That jointer was left to sit a lot and allowed to rust. This has both good and bad consequences, the motor has less wear, but the rust can create problems, as can froze/rusted bears. 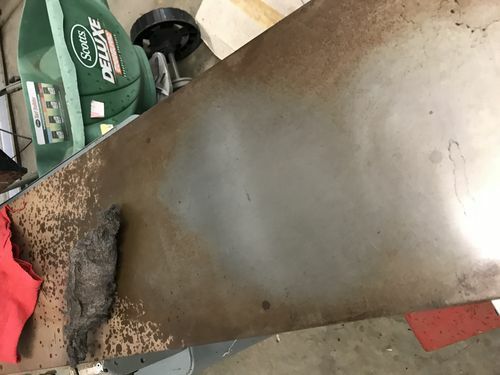 And while rust isn’t that bad to clean up/off, you’re likely going to run into dry rotted belts and such or at least belts with kinks in them causing vibration. So adding a couple hundred dollars worth of labor time/parts to your consideration is always a good idea when buying used. Also, is the paint in good shape or coming off? Repainting is doable enough, but again, isn’t free. So taking that into consideration vs. the end product once restored vs. time/money spent restoring. These things can be used as “bargaining chips” when negotiating. Off topic. Helical heads are awesome. Better for a jointer than a planer because very little adjustment is required in the long run compared to straight knives. Jason, I’ve been eyeballing that same jointer, but my drive time is double yours. I’ve found that 8” jointers just don’t move as quickly in NorCal as they do elsewhere, especially in the Reno area. Let me know what you find out. I’m not quite ready to pull the trigger on buying one just yet, just watching the market. Thanks everyone! I went to take a look at it last week and decided to pass. On the one hand, it was in decent shape. It was used in a high school wood shop, so it was likely well taken care of in the past. The individual beds were very flat according to my veritas straight edge. However, I passed on it because the fence was way out – it probably had an eighth inch smile across its length… and that is well beyond my capacity to fix. So thanks for the advice everyone… I’ll take it with me as I continue my search! Jason, I ve been eyeballing that same jointer, but my drive time is double yours. I ve found that 8” jointers just don t move as quickly in NorCal as they do elsewhere, especially in the Reno area. Let me know what you find out. I m not quite ready to pull the trigger on buying one just yet, just watching the market. See my previous comment – I choose to skip it because of the significant smile on the fence. It may not be that big of a deal for you, though. And he mentioned that someone offered him $500… but he wanted to wait until a couple of people (including me) saw it first. Its a quality machine. If I really needed a planer I would take $900 with me and offer him $750.